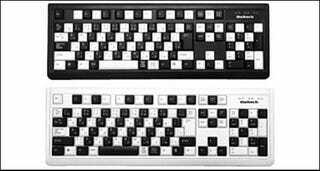 Love to play chess on your keyboard? Well, while the OWL-KB108WB from Owltech looks like you might be able to get your pawn on, looks can be deceiving. There are 2 versions, black and white, and are compatible with Macs and PCs and includes a USB adapter. No product information on the site yet but surely coming soon. Price is about $23.